Found 4 file extension associations related to TopicScape and 4 file formats developed specifically for use with TopicScape. 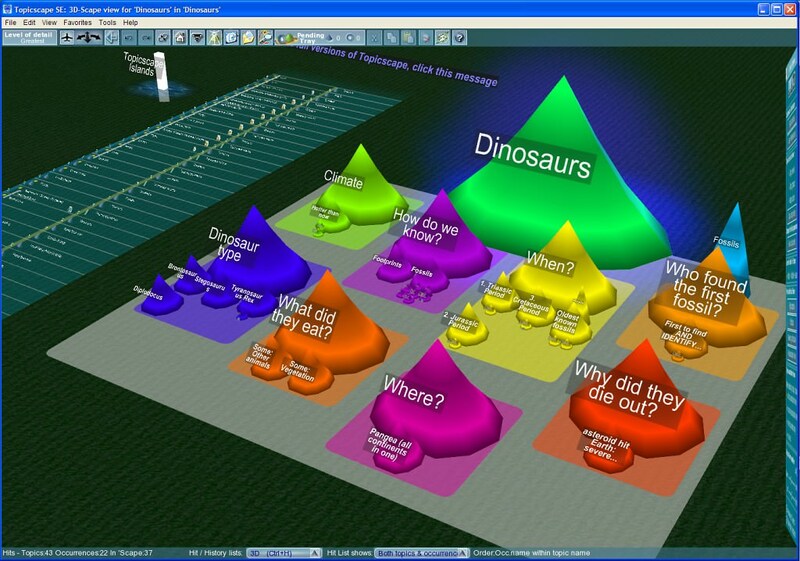 Topicscape amazing visual information organizer for Windows. Recover the cost in weeks as you organize your files, plan projects, manage information and do efficient web research, visually, with Topicscape. The Simplifiers turned out to be people who want something to help them deal with a complicated life by giving them a broad view of their ToDo lists and tasks quickly and easily. Whether they knew mind mapping or not, they liked this rare opportunity to see so much of their work laid out in a 3D landscape. For them we made Topicscape Lite. The Extenders were the ones who loved that, but could also see the extraordinary possibilities that the 3D world offers, and wanted a sophisticated link to other software that they used in the past or still use. And they could see the benefits in time saved and the instant appreciation of their work and information on screen. They craved more control, more customization and more information visualization made possible by exploiting modern 3D graphics to the full. For them we produced Topicscape Pro. If you need more information please contact the developers of TopicScape (3D-Scape Ltd.), or check out their product website.